Some of the candidate said they found the use of computer more challenging than their JAMB questions. 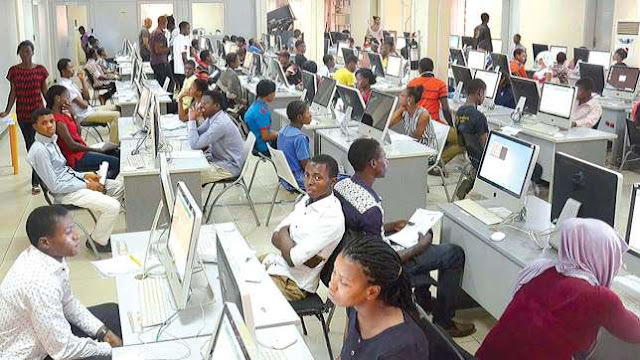 Some candidates who have written their Unified Tertiary Matriculation Examination, UTME have complained that they find the use of computer challenging during the exam. One of the candidates, Aliyu Dikko who spoke with NAN said the UTME questions were not as challenging as the use of the computer. According to NAN, Aliyu said he could not really use the computer because he came from a rural part of the country and has limited access to the computer. He added that the little knowledge he has about the use of the computer is different from what he experienced while writing the exam. “For instance, I got so tensed I skipped to the next page when I was not through with the one I was answering. “Apart from this, everything went fine with me; I’ll just go and pray that God favours me,” he said. Temitope Momodu, another candidate who had a similar experience during the exam said she started familiarising herself with computer two weeks to her exam. Momodu said that the public secondary school she finished from did not teach her the practical aspects of the computer. Another candidate, Nnoli Samuel, who spoke with NAN said some of the candidates would have been familiar with the procedure of how to use the computer if JAMB had been able to conduct a mock test for everyone before the examination proper. “Some of us are writing for the first time, it is not as if I have not used a computer before but you know this is an exam and if you make one mistake, there’s no going back. “You need to think well at the same time be fast because your time is running. I must say also that the questions were what I expected but the options were really confusing for me,” he said. However, it will take sometime before the 2018 UTME result is released. The Joint Admission and Matriculation Board, JAMB Registrar, Prof Ishaq Oloyede recently announced that it will take two or three days to release the results. The ongoing 2018 edition of the Unified Tertiary Matriculation Examination, which started on Friday, March 9, 2018, will end on Saturday, March 17.